The treatment for hydrocephalus can be divided into 3 phases  - The first phase includes the Greco-Roman era, Middle ages and Renaissance (up to 19th century AD) when the pathophysiology of hydrocephalus was unknown (medical treatment was considered useless and surgical treatment was hopeless). The second phase was in the 19th and early half of the 20th century (2nd phase), by which time the anatomy and physiology of cerebrospinal fluid (CSF) was somewhat understood and various surgical treatment modalities were attempted, though largely unsuccessfully. With the development of shunt systems from the 1950s started the 3rd phase where surgical treatment had a dominant role. A dream seemed to have been fulfilled in the life of patients with hydrocephalus. Unfortunately, it started an era of nightmares for the operating surgeons! A cerebrospinal fluid (CSF) shunt is a surgically implanted device used for diverting CSF from the cranio-spinal axis to an appropriate drainage site for absorption in a controlled manner. The diversion of the CSF may be from any CSF containing space-ventricle/subdural space/syrinx/thecal sac (commonly lumbar) or an arachnoid cyst -to any distal compartment which can absorb CSF. The preferred distal compartments may be the peritoneum, atrium and pleura, with peritoneum being the most favoured. In this article, the discussion will be centred around the ubiquitous ventricular shunt system. Diversion of CSF was attempted in the late 19th and early 20th century to various intracranial/extracranial compartments. For the purpose of diversion, several conduits were utilised like silver wires (Cushing), rubber tubes (Kausch), veins (Payr) and serosa of the gut (Heile).,, Payr et al., could be credited as the first person to use a valve (valves in the vein) in the diversion of CSF., These methods were, however, unsuccessful because the synthetic materials utilised were bio-incompatible, thus inducing tissue reactions, and natural materials could not serve the purpose. This paved the way for more physiological treatments like choroid plexectomy and third ventriculostomy (introduced by Dandy in 1918 and 1922, respectively) which were practised with limited success and a high morbidity rate till the mid-20th century., It was following World War II that the two most significant developments took place in the management of hydrocephalus with shunts. Polyethylene and silicon used for insulating spark plugs on bombers during the War were found to be non-reactive with human tissue. In 1947, it was Franc D. Ingraham who first published a report on the neurosurgical use of polyethylene. Observing the bio-compatible nature of silicon, it was introduced into medical practice from 1953 and for shunting from 1956. The advantages of silicon were instantly obvious – it was available extensively, autoclavable, and induced less tissue reaction. The second greatest advancement was the introduction of the artificial valves by Frank Nulsen and Eugene Spitz in 1949 dubbed the “Johnson Foundation” valve using platinum springs and 2 balls. In 1956, Eugene Spitz along with bioengineer, John Holter, combined the biocompatible material, silicon, to produce silicon elastomer valves (Spitz-Holter valve), which completely changed the outlook for hydrocephalus management.,, Following these two technological advancements, CSF shunting started dominating the treatment of hydrocephalus with improved success rates. A basic shunt system (from here the discussion will be with reference to the ventricular shunts) consists of 3 parts- proximal catheter; distal catheter; and shunt valve. The shunt accessories like reservoirs and connectors may also be added on to a shunt system. A shunt system without a valve may be called as “valveless” shunt and this is almost removed from contemporary neurosurgical practice (with the exception of ventriculosubgaleal shunts and some syringosubarachnoid shunts). Among the different components, it has been the shunt valve technology which has advanced significantly to minimise the failures and complications associated with shunt placement. All these components may be separate and need to be assembled together or they may come as a one-piece shunt system (e.g., Unishunt® system, Codman, Raynham, MA, USA). This represents the part of the shunt system which will drain the ventricular compartment (also called the ventricular catheter). The most common cause of shunt obstruction is catheter obstruction  and this would explain why so many variations are available in the catheter design. These catheters come with a stainless-steel stylet and a tantalum tip. The length of a catheter varies from 15cm – 23 cm. The inner diameter of a catheter ranges from 1.0-1.6 mm and the external diameter from 2.1-3.2 mm. The larger the inner diameter of the catheter, the lesser will be the resistance to CSF flow, and hence, the better the drainage up to the valve. Unfortunately, it means the greater will be the size of the cortical tunnel created by the catheter to reach the ventricle. Proximal end of the catheter may be straight/flanged/J-shaped [Figure 1]a,[Figure 1]b,[Figure 1]c. Obstruction of the proximal catheter with choroid plexus/brain parenchyma was noted as a common cause for shunt dysfunction by Hakim et al., in 1969. Hakim et al., had introduced the J-shaped catheter (Shepherd -Crook) with the drainage holes along the concave side to avoid direct contact with the choroid plexus  [Figure 1]d. Portnoy et al., introduced the flanged catheter with an idea – the flanges could protect the holes as long as the catheter passed via the brain parenchyma, and inside the ventricle, the flanges would keep the catheter tip away from the choroid plexus. [Figure 1]c. This design was found to be successful by Haase and Weeth et al., in 1976 in reducing obstruction, but in those patients who needed a revision, it was associated with a higher risk of re-bleed. Another concept introduced in 1982 was the “floating ventricular catheter” (Nakamura et al.,) in which an air pocket was introduced around the catheter to keep it floating and to help in avoiding contact with the ventricular wall and choroid tissue. Saint-Rose et al., in his analysis of 1,719 patients, found that none of these catheters reduced the incidence of catheter blockage. Distal end of the catheter may be right-angled or straight. When the proximal catheter comes out of the burr hole, it undergoes an almost right-angled kinking and this may cause resistance to the flow of CSF. To avoid this, the concept of right-angled catheters [Figure 1]b were introduced, which has an inherent bend that lies across the burr hole. These right-angled catheters, however, have a fixed length which needs to be within the ventricle and cannot be adjusted to the length a neurosurgeon would desire. Today's right-angled connectors or right-angled adapters [Figure 2] are also available to avoid kinking across the burr hole but in infants this may lead to erosion of the skin because of their hard nature (especially the right-angled plastic adapters). In 1982, in a study by Sekhar et al., investigating various tissue types adsorbing to the catheter surface, it was found that not only does the choroid plexus or glial tissue have an adsorbing tendency, but inflammatory and granulomatous tissue also adsorb to the catheter. This could probably be based on the hydrophobic properties of silicon and is the cause of bacteria colonisation. Based on the early experiment by Bayston and Milner to introduce antibiotics along with silicon polymer to reduce infection rates, came up the concept of antibiotic impregnated shunts. There are 3 varieties available now –Bactiseal® (Codman); Ares® (Medtronics) and Silverline® (Spiegelberg).The first two contain rifampicin and clindamycin coating along with silicon and seem to be quite effective in avoiding infections for at least one month (most infections are transmitted during surgery and these antibiotics are useful in preventing them)., Silverline® is different in the sense that it is coated with an insoluble silver salt, which is gradually released; this silver has strong anti-bacterial properties against both gram-positive/negative organisms, and hence works for a longer period. A meta-analysis conducted in 2014 regarding infection rates on comparing AICs and non-coated silicon catheters revealed that there is only class III evidence available to suggest that AICs reduce the infection rate. At present, there is a randomised control trial (BASICS – British Antibiotic and Silver Impregnated Catheter for Ventriculoperitoneal Shunts) going on and the results are expected to give a clearer picture about the efficacy of these devices. In order to improvise the technique of placement of the proximal catheter inside the ventricle, these catheters have been ergonomically modified to have a slit tip through which a fibreoptic endoscope (Neuropen®, Medtronics) can be passed, which acts as a stylet as well as provides vision to place the catheter in a desired location [Figure 3]. These catheter are available as Neuropen ® endoscope – Innervision® catheter (Medtronics) and Bactiseal endoscopic ventricular catheter® (BEVC, Codman). In the experience of the senior author, the introduction of endoscope (the so-called shuntscope) remains essentially a “blind” procedure so far as the site of exact placement of the shunt tip is concerned. Following the introduction of slit valves, it was incorporated into the distal catheters as an additional valve by Pudenz et al., It was suggested by Raimondi and Matsumoto in 1967 that slit valves prevent obstruction of the distal catheter opening by the omentum., Usually the distal tip is closed and slit valves are present proximal to the tip. But in the 1980s, the distal ends were kept open and the slit valves left to act as safety valves. The latter open up when the distal open tip is occluded by viscous material/omentum. A landmark study in 1997 by Cozzens et al., had suggested that it is the presence of distal slit valves that increased the chance of distal catheter block and so catheters must be placed open-ended without slits. This conclusion was also supported by C. Saint-Rose and J. Drake in their shunt book in 1995. Like proximal catheters, distal catheters were also coated with barium to make them opaque on an X-ray and this is also responsible for their white colour. In 2 separate studies by Yamamoto et al., and Boch et al., on long-term shunt complications, it was identified that barium sulphate impregnated shunt systems have a higher rate of calcification followed by breakage, leading to dysfunction., It was proven by Tomes et al., in an experimental study in 2003 that barium impregnated catheters required less strain to fracture when subjected to strength testing. Hence, to avoid this, now the distal catheters are available as barium striped or radiolucent (barium free) and tantalum marked. They are the most important components of the shunt system which regulates the outflow of CSF from the ventricles to the draining compartment. They basically control the direction of flow (they provide only one-way directionality from the ventricle to the drain site) and the quantity of flow (based on pressure difference between the two compartments). Shunt valves have gone through more rigorous testing than aircraft engines over the last few decades, and at present, there are nearly 200 types of shunt valves used by 3 generations of neurosurgeons., The next few paragraphs illustrate why the physics of shunt valves has to be understood in great details. Where ƿ represents the density of the fluid, g the gavitational force (9.8m/s) and, h the height of column of the fluid. With ƿ and g remaining constant for a fluid, it is the height of the fluid column that determines the HSP. The reference level represents the level at which the fluid column equals the atmospheric pressure (0 cm H2O). In the above figure [Figure 4], there is a fixed quantity of water inside a water container with an opening at the bottom (reference level). 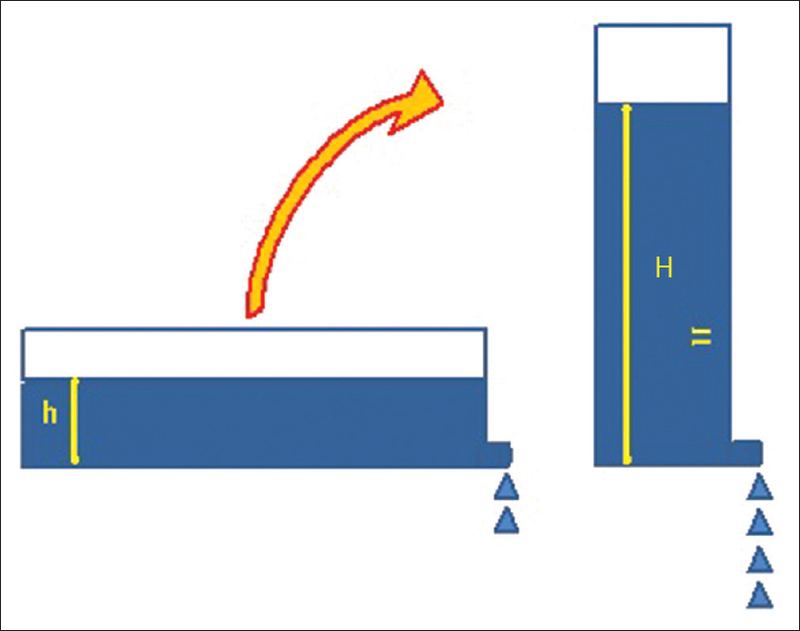 When this container is laid flat, the water column has a lesser height (h); therefore, HSP is lower and water flows out at a particular speed (2 drops/min). When this water container is placed vertically, the height of the column increases to H and, therefore, the HSP increases leading to a faster flow rate (4 drops/min). In reality, the fluid in this experiment represents the CSF and the container represents the ventricular system and the spinal subarachnoid space (SAS). When person is lying flat, the reference level (0cm H2O) is the surface of the abdomen; and, when the person stands, the reference level moves to the diaphragm. When a person is in a supine posture, there is slow CSF flow within the 2 compartments; whereas, when the person stands up, the CSF inside the ventricle flows rapidly into the spinal SAS creating a negative pressure in the cranium which is physiologically compensated by collapse of the jugular veins. When a patient has a shunt, flow of CSF occurs through the shunt system and not through the normal pathway. When this patient is lying down, flow across the shunt tube occurs similar to the physiological manner whenever the intracranial pressure increases (ICP). But when the same patient stands up, there is a rapid increase in the HSP (height between the foramen of Monroe and diaphragm is around 30-40cm) and this may lead to a non-physiological high flow rate across the shunt tube. The reason behind deploying valves across the shunt tube is for regulation of this flow. The OP or CP is the most important defining characteristic of a valve, and those valves which function solely based on pressure difference between the 2 compartments are known as the Differential Pressure Valves (DPV). They represent the first-generation valves that were developed. They function based on differential pressure between the 2 compartments by either opening or closing. They were classified as– Very low; Low; Medium; High; and Very high, based on the differential pressure range around which they function. Unfortunately, different manufacturers have defined their own pressure ranges to describe these valves and there is no uniformity. For example, if a medium pressure valve is defined with an OP of 10cm H2O, this valve opens when the DP between the 2 compartments exceeds 10 cm H2O and remains closed if the DP is <10cm H2O. Those valves that close when the DP exceeds the CP are known as the Inverse DPV (iDPV). 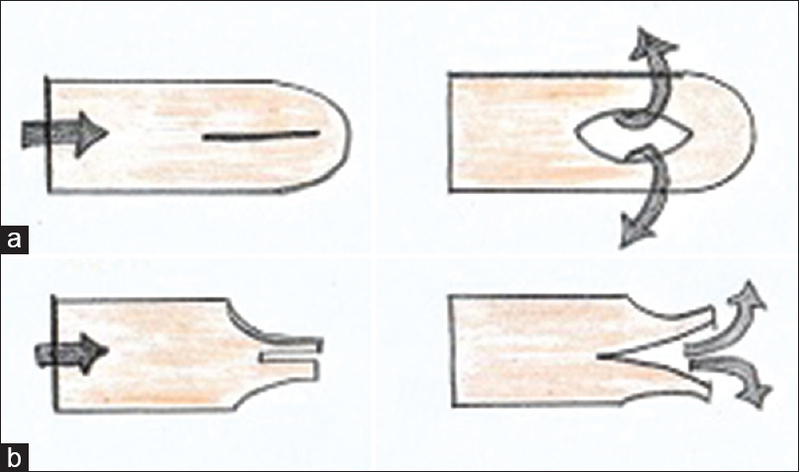 Based on their mechanical design, the DPV can be classified into four types: Slit; Mitre; Diaphragm; and, Ball in cone [Figure 5]. Slit valves represent the first design that was developed by Spitz-Holter in 1956. As the name suggests, they have a slit in the tube which opens up when the pressure builds inside the catheter, or else they remain closed. Mitre valves, commonly known as “duck bill” like valves, have 2 leaflets which are closely opposed to each other. When a particular pressure builds up, the CSF pushes the 2 leaflets apart and finds its way out into the distal catheter or the draining compartment. 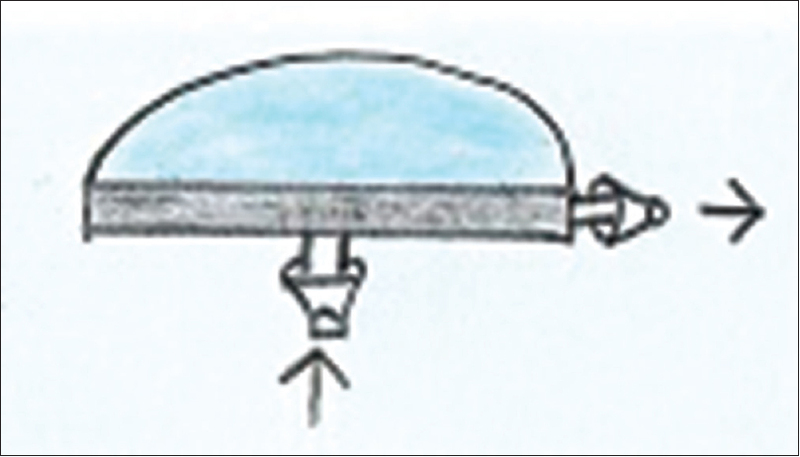 Diaphragm valves are actually constituted by a membrane closing an opening. 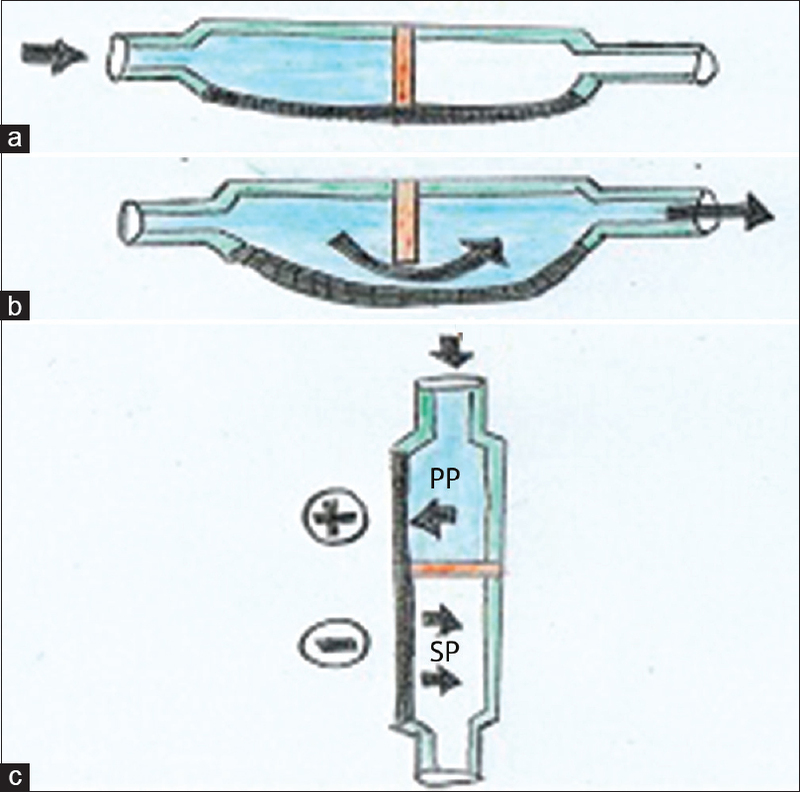 When the pressure increases in the proximal end, CSF pushes the membrane away from the opening and drains CSF [Figure 6]a.
Ball-in-cone valves (Ball-spring valve) were first described by Solomon and Hakim in the 1970s. They consist of a ball (a metallic one) held occluding an opening with the support of a spring. When DP crosses the OP, the ball is pushed against the spring and CSF escapes distally [Figure 6]b. 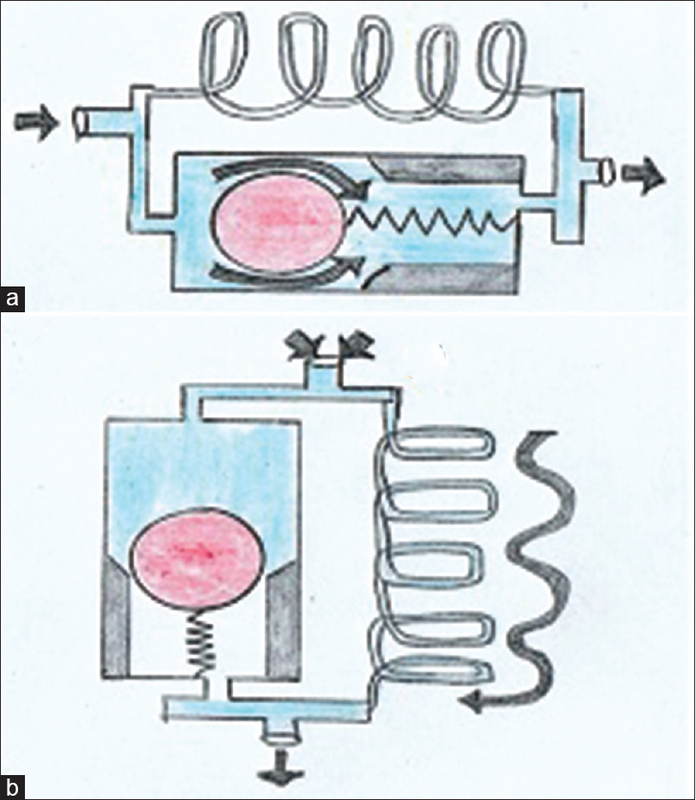 A problem related to the functioning of the fixed DPV valve is the phenomenon of hysteresis. All the 3 groups function to reduce CSF flow when a person comes to a standing position but are based on different mechanisms. Another term that needs to be introduced here is “siphoning.” When a person gets up from a recumbent posture to a standing posture, the fluid level (CSF) in the cranial cavity is at a higher level than the abdominal cavity causing the CSF to flow rapidly into the abdomen till the amount of fluid is equal in both the compartments. This phenomenon is known as “siphoning” [Figure 8].,, It is because of this siphoning of CSF that over-drainage symptoms may occur in a patient who has undergone a shunt procedure. In order to avoid this “siphoning,” a device was created in 1973 by Portnoy and Heyer Schulte known as the anti-siphon device. The earlier anti-siphon devices that were created were extra attachments to the existing DPVs, but later on, the newer ones were hybrid models where the anti-siphon device was incorporated into the shunt system. These devices work on the principle that the suction effect due to the upright position of the patient may be used to pull on a membrane, which in turn occludes the pathway for CSF drainage. The greater the suction effect, more effective the occlusion. 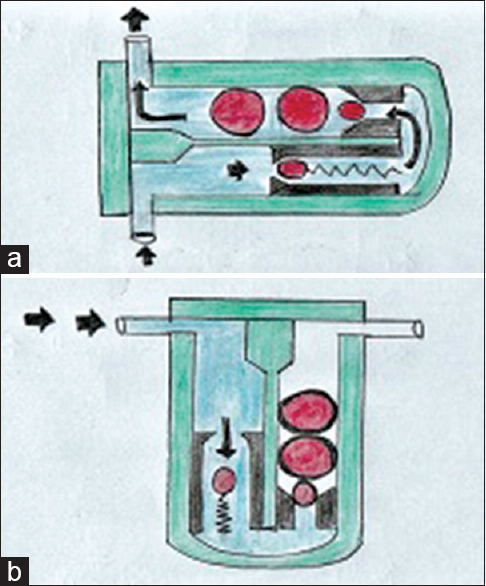 In a normal DPV, the positive pushing pressure from above (ICP) in addition to the negative pulling/sucking pressure from below (the siphon effect) help to drain the CSF into the collecting compartment (the two pressures complement each other). In the suction controlled devices, the positive pressure from above (ICP) tries to drain CSF through the pathway whereas the suction effect from below (negative pressure) tries to occlude the same pathway for CSF (the two pressures counter each other). These devices are available today in the form of anti-siphon device (ASD® Integra) and Delta® chamber (Medtronics). This entire valve system is placed in the subcutaneous plane and is susceptible to external subcutaneous pressure (leading to scarring or to hematoma formation) which may alter the effective functioning of the valve. These devices were developed with an idea that if flow can be controlled then siphoning can be avoided. They were believed to maintain a constant flow rate and were broadly divided into 2 types, either a binary flow control or a continuous flow control. In the binary flow control device, CSF takes two pathways depending on the differential pressure, with the two pathways offering either a low flow resistance or a high flow resistance, respectively. In the continuous flow control system, as the DP increases, the resistance to flow increases linearly till an “emergency state,” where DP is very high and rapid increase in flow occurs to reduce DP. They are available as Siphonguard® [Codman; [Figure 9]; Orbis-Sigma valve ® [OSV – Integra; introduced by Saint Rose in 1989; [Figure 10] and CRx Diamond ®valve (Vyogo Neuro). Siphonguard® from Codman represents a binary flow control device and the other two are continuous flow control devices. In OSV®, the diameter of the flow chamber during the high resistance period is 15-20um. This can be blocked by monocytes present in the CSF leading to dysfunction of the valve on a long-term basis. 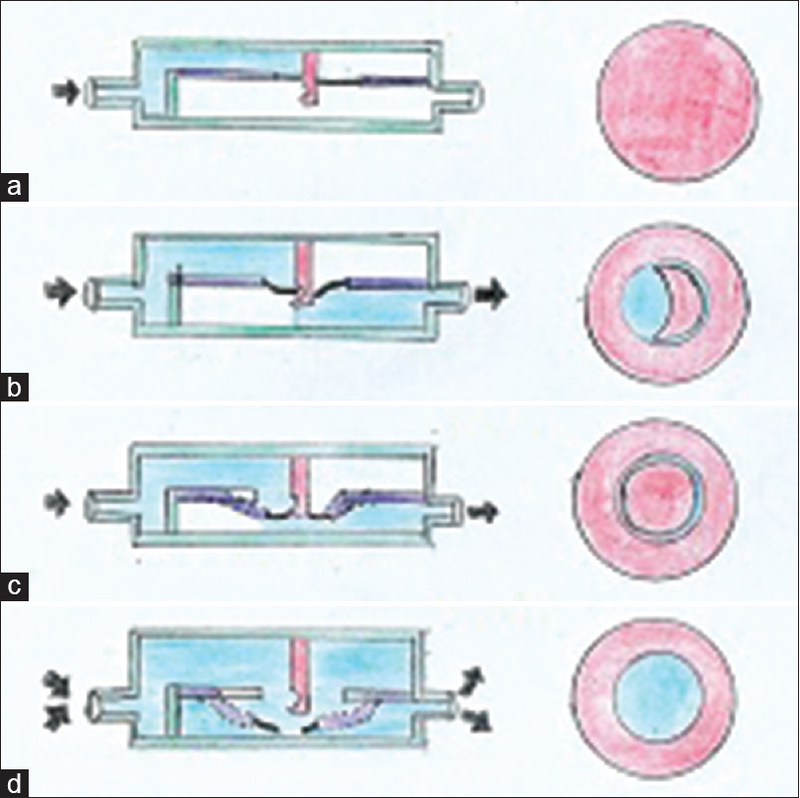 This concept of using metal balls to regulate flow across an opening was introduced by Hakim et al., in 1974., It was first used for a lumbo-peritoneal shunt and then implemented in ventricular shunts. These devices function basically like the DPVs but they are capable of increasing the OP as the inclination of the patient increases (thus, their mechanism of action is posture dependent). They work on a very simple concept in which 2-4 metal balls exist in a valve. 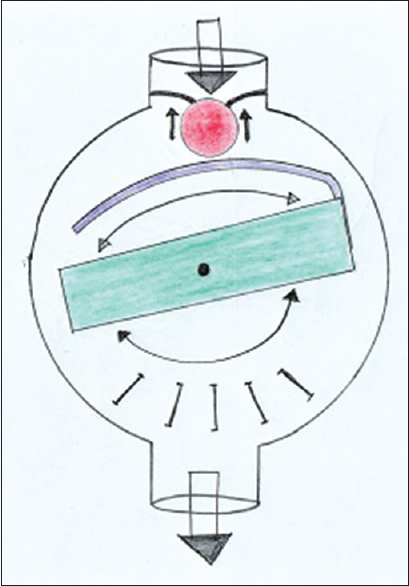 When a patient is lying supine, they act as a simple DPV with only one metal ball acting in the ball-in-cone mechanism [Figure 11]; the other metallic balls having no role in the pressure regulation to control the CSF flow]. As the posture changes and the inclination increases, the other metal balls, one by one, fall over the conical opening, thereby adding on to the opening pressure needed to maintain the CSF egress through the valve. Basically, the weight of the metal balls counters the increasing hydrostatic pressure. They may also be divided into the binary switcher valves (Dualswitch Valve ®–Miethke) and the analogous valves (Shuntassistant® – Aesculap; Gravity –Compensating Accessory ®– Integra) depending on whether they act solely in the supine (low OP) or standing (high OP) positions, respectively, or continuously change OP as inclination increases. They form the other group of second generation valves that have evolved to avoid the complications associated with fixed DPV., Basically, they are adjustable DPV s in which non-invasively, the DP can be altered. They are in no way related to computer programming and the name 'programmable valve' was given just for marketing of the valves. The most important advantage of the adjustable DPV is the ability to alter the OP non-invasively as per the response of the patient based upon the anticipated CSF over- or underdrainage [Figure 12]. The concept of controlling the opening pressure of a valve from outside was initiated by Portnoy and Solomon Hakim in 1973,, following which the first programmable valve designed for clinical use was introduced in 1989 (PAVS, Pressure Adjustable Valve- SOPHY® – Sophysa France)., The currently available adjustable DPV are Codman-Hakim programmable valve® (CHPV); Strata® NSC (Medtronics); and, Sophysa Polaris valve® (SPV) (Sophysa). The CHPV system can be adjusted between 3cm H2O and 20cm H2O in 18 steps (in 1cm H2O adjustments). To identify the existing pressure setting, however, an X-ray imaging would be needed. The Strata NSC (no siphon control; Medtronics) system comes with 5 different pressure level (PL) settings which can be identified and altered using an adjustment kit (Varius® system) [PL0.5 – 1.5-3.5cm H2O; PL1.0 – 3.5-5.5cm H2O; PL1.5 – 9-11cm H2O; PL2.0 – 14.5-16.5cm H2O and PL 2.5 – 20-22cm H2O]. The SPV (Sophysa) system comes with 5 different pressure level settings, which can be identified and altered with the help of an adjustment tool kit. Depending on the maximum pressure settings, the devices are available in the following forms: standard SPV (3, 7, 11, 15 and maximum 20cm H2O); SPV-140 (maximum 14cm H2O); SPV-300 (maximum 30cm H2O) and SPV-400 (maximum 40cm H2O). The most important issue to be remembered about the adjustable DPV devices is that once adjusted to a particular pressure level, they act like fixed DPV only, with an opening pressure to control CSF flow. Hence, there still is a high chance for under- or overdrainage. Therefore, the use of the adjustable DPV does not unequivocally ensure that under or overdrainage will not occur; however, should under- or overdrainage be clinically observed, then the OP of these devices can be suitably altered externally using a magnetic device, thereby reducing the need for another surgery to change the valve. This includes shunt reservoirs and connectors. They are also known as shunt chambers, which are CSF collecting systems along the shunt catheter. They are used to collect CSF samples (to facilitate a shunt tap), to measure the CSF pressure (ICP) and also to inject drugs into the ventricular system. They are made of silicon which can seal off following a puncture. The base may be made of silicon/plastic/titanium/ceramic. They are available in 2 types – the burr hole type or the inline type (the cylindrical type) [Figure 13] and [Figure 14]. Sometimes, medical personal can test shunt function by flushing the chamber (normally in 1 flush, 0.1-0.3 ml of CSF can be drained). This is, however, not a reliable method to test shunt function unless there is a valve to prevent backflow into the ventricle. 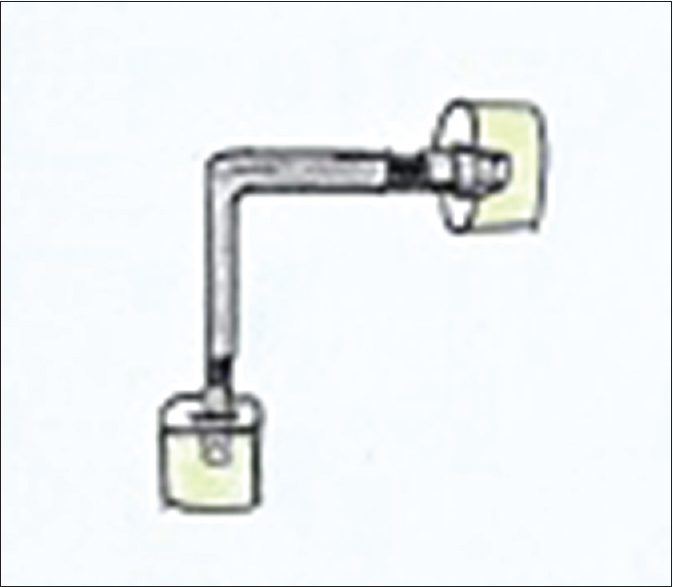 They are used in all shunt systems, except the one-piece shunts, to connect different parts of the shunt system [Figure 15] and [Figure 16]. They may be manufactured using titanium (which provides a good mechanical stability but causes increased artefacts on magnetic resonance imaging [MRI]) or plastic (these have a poor mechanical stability but cause no MRI artefacts). The one-piece shunt systems were introduced to counter the incidence of shunt disconnection. They proved to be equally effective in treating hydrocephalus by Raimondi et al., in an analysis of 357 patients. Haase et al., from Denmark in 1987 had suggested a long-term follow-up of the one-piece shunt systems. They had suggested that the one-piece shunt systems were effective in providing an effective CSF diversion though they could be complicated by proximal catheter obstruction and slit ventricles. Also, the one-piece shunts are associated with a higher incidence of intracranial shunt migrations. 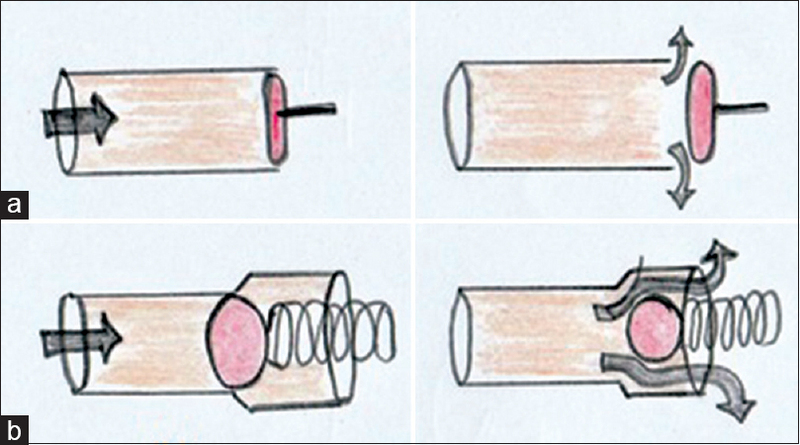 The senior author has described how one-piece shunts packaged in a coiled manner have a greater tendency to migrate [due to their elastic recoil, [Figure 17]. They are available in the market as the Unishunt® system (Codman). This part has already been discussed extensively by the author in the section under 'proximal catheter.' The amount of barium impregnated in the catheter does not play a role in their intraventricular placement as they do not get calcified. BioGlide® catheters have been withdrawn from the market. The exact role of antibiotic impregnated catheters will be better known after the results of the BASICS trial have been published [Figure 18]. Figure 18: The various degrees of “coils” that are introduced while packaging different shunt systems. A randomised control trial conducted at multiple centres across North America and Europe comparing DPV with hydrostatic devices (OSV, Delta valve) by Drake et al., in 1998 (Shunt Design Trial – Class I) concluded that none of the valves were superior to each other with regard to shunt survival, both on a short-term and a long-term follow-up basis.,, A Cochrane review in 2013 also suggested that at present, there is insufficient evidence available to suggest the superiority of the flow-regulated devices over the simple DPV. Pollack et al., had conducted another randomised control trial in 1999 comparing fixed/simple DPVs with programmable valves. From his analysis of 377 patients, it was identified that there was no significant difference in the incidence of shunt survival between the 2 groups, though this study was not done with the aim to assess the shunt survival (Class II)., From the same group, it was also noted that the use of programmable valves reduced the need for surgical intervention in patients who develop a subdural hematoma as a post-shunt sequel, by manipulating the pressure non-invasively. A meta-analysis in 2014 had tried to analyse all the available studies comparing different types of shunt valves and concluded that there is at present insufficient evidence to suggest the superiority of one valve hardware design over the other. This meta-analysis also recommended that, at present, there is insufficient evidence to suggest the preferential usage of programmable valves over the simple DPVs. Irrespective of these trials, at present, most neurosurgeons prefer programmable valves, at least for conditions like normal pressure hydrocephalus where the intracranial pressure settings are most unpredictable. The most important factor predicting shunt survival has been the OP which had been initially chosen. With respect to children with hydrocephalus, the senior author prefers to use low-pressure (LP) valves as long as the anterior fontanelle is open; and, medium pressure (MP) valves, once the fontanelle closes. There have been two large retrospective series from Miranda et al., (103 children) and Robinson et al., (158 children) which provided contradicting reports that MP shunts have been associated with more obstruction; and, that LP shunts are associated with more failures, respectively., A small randomized control study by Sinha et al., had not suggested any role of MP/LP status on shunt survival in children. With respect to the adults (especially those suffering from normal pressure hydrocephalus), the ideal OP to start with is yet to be identified but Miyake et al., had suggested a QRT (Quality Reference Table) which would help to decide this issue based on the height and weight of the patient as well as the starting OP existing at the time of placement of the shunt. Also, the same author had later proposed that if according to the QRT, the OP falls in the range of 15-20cm H2O, it would be better to place a hydrostatic device to avoid over-drainage. Bergsneider et al., had suggested using a programmable valve with the highest setting and then, depending on the response of the patient, to gradually reduce the pressure by 3cm H2O gradations until adequate response is obtained. The question, what an IDEAL shunt actually is, still remains unanswered due to the lack of adequate, good quality, comparative studies but from the current literature it can be presumed that the IDEAL shunt would be the one which is most suited for a patient as well as most familiar for the neurosurgeon performing the procedure. Milojevi AJ, Radoj BS. Hydrocephalus — History of surgical treatment over the centuries. Sanamed 2012;7:119-25. Goodrich JT. Historical Vignettes on the Medical and Surgical treatment of Hydrocephalus. In: Kombogiorgas D, ed. The Cerebrospinal Fluid Shunts. First. Hauppauge, New York; Nova Science Publishers. 2017:1-20. Ames RH. Ventriculo-peritoneal shunts in the management of hydrocephalus. J Neurosurg. 1967;27:525-9. Rachel R. Surgical treatment of hydrocehalus: A historical perspective. Pediatr Neurosurg 2000;30:296-304. Lifshutz JI, Johnson WD. History of hydrocephalus and its treatments. Neurosurg Focus 2001;11:E1. doi: 10.3171/foc.2001.11.2.2. Weisenberg SH, TerMaath SC, Seaver CE, Killeffer JA. Ventricular catheter development: Past, present, and future. J Neurosurg 2016;125:1504-12. Abbott R. Cerebrospinal Fluid Shunts: Selection Of Components, Techniques For Insertion and for Revision. In: Kombogiorgas D, ed. The Cerebrospinal Fluid Shunts. First. Hauppauge, New York; Nova Science Publishers; 2017:221-44. Nesvick CL, Khan NR, Mehta GU, Klimo P. Image guidance in ventricular cerebrospinal fluid shunt catheter placement: A systematic review and meta-analysis. Neurosurgery. 2015;77:321-31. Miethke C. Manufacture and Function of Cerebrospinal Fluid Shunts. In: Kombogiorgas D, ed. The Cerebrospinal Fluid Shunts. First. Hauppauge, New York; Nova Science Publishers; 2017:99-220. Caǧavi F, Akalan N, Celik H, Gür D, Güçiz B. Effect of hydrophilic coating on microorganism colonization in silico ne tubing. Acta Neurochir (Wien) 2004;146:603-10. Chen H-H, Riva-Cambrin J, Brockmeyer DL, Walker ML, Kestle JRW. Shunt failure due to intracranial migration of BioGlide ventricular catheters. J Neurosurg Pediatr 2011;7:408-412. Hakim S. Observations on the physiopathology of the CSF pulse and prevention of ventricular catheter obstruction in valve shunts. Dev Med Child Neurol Suppl 1969;20:42-8. Portnoy HD. New ventricular catheter for hydrocephalic shunts. J Neurosurg 1971;34:702-3. Haase J, Weeth R. Multiflanged ventricular Portnoy catheter for hydrocephalus shunts. Acta Neurochir (Wien) 1976;33:213-8. Sainte-Rose C, Piatt JH, Renier D, Pierre-Kahn A, Hirsch JF, Hoffman HJ, et al. Mechanical complications in shunts. Pediatr Neurosurg 1991; 17:2-9. 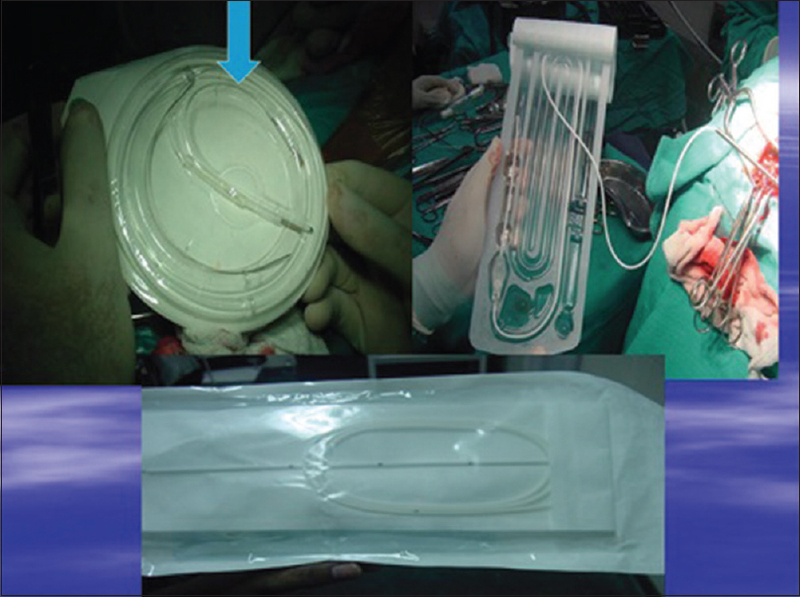 Nakamura S, Moriyasu N. Floating ventricular catheter: A new shunting device. Monogr Neural Sci 1982;8:191-4. Elisabeth M. Post MD. Currently available shunt systems: A review. Neurosurgery. 1985;16:257-60. Lin J, Morris M, Olivero W, Boop F, Sanford RA. Computational and experimental study of proximal flow in ventricular catheters. J Neurosurg 2003;99:426-31. Thomale UW, Hosch H, Koch A, et al. Perforation holes in ventricular catheters-is less more? Childs Nerv Syst 2010;26:781-9. Sekhar LN, Moossy J, Norman Guthkelch A. Malfunctioning ventriculoperitoneal shunts. J Neurosurg 1982;56:411-6. Parker S, McGirt MJ, Murphy J, Megerian TJ, Sto ut M, Engelhart L. Comparative effectiveness of antibiotic-impregnated shunt catheters in the treatment of adult and pediatric hydrocephalus: analysis of 12,589 consecutive cases from 287 US hospital systems. J Neurosurg. 2015;122:443-8. Kan P, Kestle J. Lack of efficacy of antibiotic-impregnated shunt systems in preventing shunt infections in children. Child's Nerv Syst 2007;23:773-7. Klimo P, Thompson CJ, Baird LC, Flannery AM, Pediatric Hydrocephalus Systematic Review and Evidence-Based Guidelines Task Force. Pediatric hydrocephalus: Systematic literature review and evidence-based guidelines. Part 7: Antibiotic-impregnated shunt systems versus conventional shunts in children: A systematic review and meta-analysis. J Neurosurg Pediatr 2014;14(Suppl 1):53-9. Sainte-Rose C, Drake JM. The Shunt Book. First edition. Cambridge, MA: Wiley-Blackwell Science; 1995. Hahn YS, Raimondi AJ. Ve ntriculo-peritoneal shunting with one piece spring catheter. Technical note. Yonsei Med Jorunal 1976;17:157-62. Available from: https://ymj.kr/Synapse/Data/PDFData/0069YMJ/ymj-17-157.pdf. [Last accessed on 2017 Sep 07]. Raimondi AJ, Matsumoto S. A simplified technique for performing the ventriculo-peritoneal shunt. J Neurosurg 1967;26:357-60. Cozzens JW, Chandler JP. Increased risk of distal ventriculoperitoneal shunt obstruction associated with slit valves or distal slits in the peritoneal catheter. J Neurosurg 1997;87:682-6. Yamamoto S, Ohno K, Aoyagi M, Ichinose S, Hirakawa K. Calcific deposits on degraded shunt catheters: Long-term follow-up of V-P shunts and late complications in three cases. Child's Nerv Syst 2002;18:19-25. Boch AL, Hermelin E, Sainte-Rose C, Sgouros S. Mechanical dysfunction of ventriculoperitoneal shunts caused by calcification of the silicone rubber catheter. J Neurosurg 1998;88:975-82. Tomes DJ, Hellbusch LC, Alberts LR. Stretching and breaking characteristics of cerebrospinal fluid shunt tubing. J Neurosurg 2003;98:578-83. Aschoff A, Kremer P, Hashemi B, Kunze S. The scientific history of hydrocephalus and its treatment. Neurosurg Rev 1999;22:67-95. Richard KE, Block FR, Steinberg HJ. Testing of Hydrocephalus Shunt Systems. In: Wenker H, Klinger M, Brock M, Reuter F (eds) Spinal Cord Tumors Experimental Neurosurgery Neurosurgical Intensive Care. Advances in Neurosurgery, vol 14. Springer, Berlin, Heidelberg 1986:268-73. Ginsberg HJ, Drake JM. Shunt Hardware and Surgical Technique. In: Pediatric Hydrocephalus. Milano; Springer Milan; 2005:295-313. Czosnyka M, Czosnyka Z, Whitehouse H, Pickard JD, Whitehouse H, Pickard JD. Hydrodynamic properties of hydrocephalus shunts: United Kingdom shunt evaluation laboratory. J Neurol Neurosurg Psychiatry1997;62:43-50. Portnoy H. Anti-siphon and reversible occlusion valves for shunting in hydrocephalus and preventing post-shunt subdural hematomas. J Neurosurg 1973;38:729-38. Faulhauer K, Schmitz. P. Overdrainage phenomena in shunt treated hydrocephalus. Acta Neurochir (Wien) 1978;45:89-101. Higashi S, Futami K, Matsuda H, Yamashita J, Hashimoto M, Hasegawa M, et al. Effects of head elevation on intracranial hemodynamics in patients with ventriculoperitoneal shunts. J Neurosurg 1994;81:829-36. Bergsneider M, Peacock WJ, Mazziotta JC, Becker DP. Beneficial effect of siphoning in treatment of adult hydrocephalus. Arch Neurol 1999;56:1224-9. Kurtom KH, Magram G. Siphon regulatory devices: Their role in the treatment of hydrocephalus. Neurosurg Focus 2007;22:1-8. Freimann FB, Luhdo M-L, Rohde V, Vajkoczy P, Wolf S, Sprung C. The Frankfurt horizontal plane as a reference for the implantation of gravitational units: A series of 376 adult patients. Acta Neurochir (Wien) 2014;156:1351-6. Park J, Kim GJ, Hwang SK. Valve inclination influences the performance of gravity-assisted valve. Surg Neurol 2007;68:14-18. Miyake H. Shunt devices for the treatment of adult hydrocephalus: Recent progress and characteristics. Neurol Med Chir (Tokyo). 2016;56:274-83. Matsumae M, Sato O, Itoh K, Fukuda T, Suzuki Y. Quantification of cerebrospinal fluid shunt flow rates. 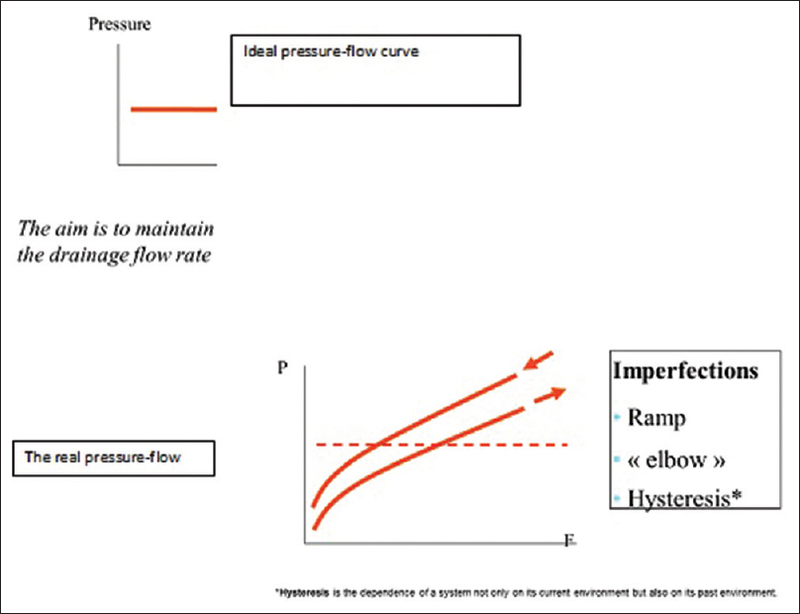 Assessment of the programmable pressure valve. Childs Nerv Syst 1989;5:356-60. Lumenta CB, Roosen N, Dietrich U. Clinical experience with a pressure-adjustable valve SOPHY in the management of hydrocephalus. Childs Nerv Syst 1990;6:270-4. Tsunoda A, Ohno S, Maruki C. Clinical experience with a hybrid shunt system combined gravity assisted device with a pressure-programmable valve in the management of idiopathic normal pressure hydrocephalus (surgical techniques and perioperative management). Japanese J Neurosurg 2009;18:907-13. Raimondi AJ, Robinson JS, Kuwamura K. Complications of ventriculo-peritoneal shunting and a critical comparison of the three-piece and one-piece systems. Pediatr Neurosurg 2008;3:321-42. Haase J, Bang F, Tange M. Danish experience with the one-piece shunt. Child's Nerv Syst 1987;3:93-6. Eljamel MS, Sharif S, Pidgeon CN. Total intraventricular migration of unisystem ventriculo-peritoneal shunt. Acta Neurochir (Wien) 1995;136:217-8. 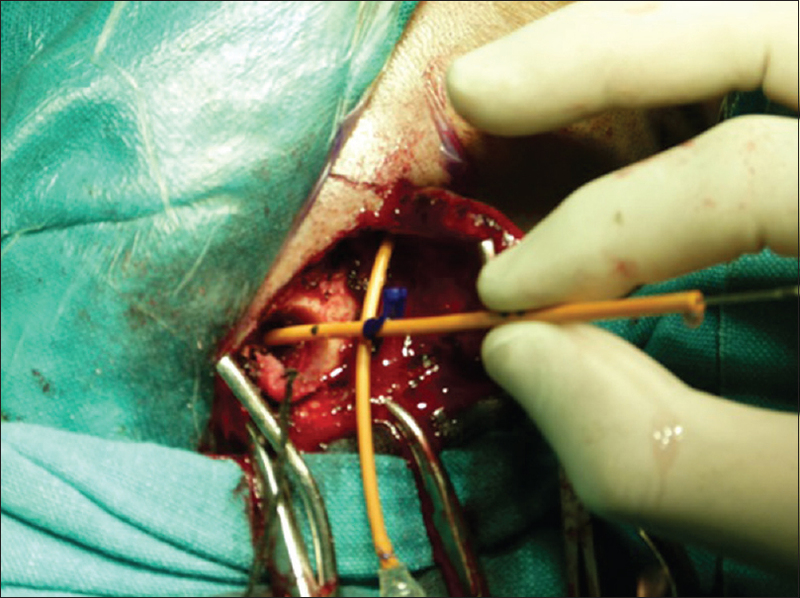 Sil K, Chatterjee S. Coiling of ventriculo-peritoneal shunt in subdural space: A possible etiology. J Paed Neurosciences 2006;1:31-2. Chen H-H, Riva-Cambrin J, Brockmeyer DL, Walker ML, Kestle JRW. Shunt failure due to intracranial migration of BioGlide ventricular catheters. J Neurosurg Pediatr 2011;7:408-12. Maset AL, Suriano LC, Monteiro R, et al. Shunt implantations and peritoneal catheters: Do not cut beyond 20 cm. Surg Neurol Int 2014;5:130. Kestle J, Drake J, Milner R, Pinto JRC, deAndrade JR, Mancini BM, et al. Long-term follow-up data from the shunt design trial. Pediatr Neurosurg 2000;33:230-6. Kestle J, Milner R, Drake J. The shunt design trial: Variation in surgical experience did not influence shunt survival. Pediatr Neurosurg 1999;30:283-7. Drake JM, Kestle JR, Milner R, et al. Randomized trial of cerebrospinal fluid shunt valve design in pediatric hydrocephalus. Neurosurgery 1998;43:294-305. Ziebell M, Wetterslev J, Tisell M, Gluud C, Juhler M. Flow-regulated versus Differential Pressure-regulated Shunt Valves for Adult Patients with Normal Pressure Hydrocephalus. In: Ziebell M, ed. Cochrane Database of Systematic Reviews. Chichester, UK: John Wiley & Sons, Ltd; 2013:CD009706. doi: 10.1002/14651858.CD009706.pub2. Baird LC, Mazzola CA, Auguste KI, Klimo P, Flannery AM. Pediatric Hydrocephalus Systematic Review and Evidence-Based Guidelines Task Force. Pediatric hydrocephalus: Systematic literature review and evidence-based guidelines. Part 5: Effect of valve type on cerebrospinal fluid shunt efficacy. J Neurosurg Pediatr 2014;14(Suppl 1):35-43. Carmel PW, Albright AL, Adelson PD, Canady A, Black P, Boydston W, et al. Incidence and management of subdural hematoma/hygroma with variable- and fixed-pressure differential valves: A randomized, controlled study of programmable compared with conventional valves. Neurosurg Focus 1999;7:e7. Symss NP, Oi S. Is there an ideal shunt? A panoramic view of 110 years in CSF diversions and shunt systems used for the treatment of hydrocephalus: From historical events to current trends. Childs Nerv Syst 2015;31:191-202. Miranda P, Simal JA, Menor F, Plaza E, Conde R, Botella C. Initial proximal obstruction of ventriculoperitoneal shunt in patients with preterm-related posthaemorrhagic hydrocephalus. Pediatr Neurosurg 2011;47:88-92. Robinson S, Kaufman BA, Park TS. Outcome analysis of initial neonatal shunts: Does the valve make a difference? Pediatr Neurosurg 2002;37:287-94. Sinha A, Sharma A, Gupta C. Pediatric hydrocephalus: Does the shunt device pressure selection affect the outcome? J Indian Assoc Pediatr Surg 2012;17:54. Miyake H, Kajimoto Y, Tsuji M, Ukita T, Tucker A, Ohmura T. Development of a quick reference table for setting programmable pressure valves in patients with idiopathic normal pressure hydrocephalus. Neurol Med Chir (Tokyo). 2008;48:427-32. Bergsneider M, Black PM, Klinge P, Marmarou A, Relkin N. Surgical management of idiopathic normal-pressure hydrocephalus. Neurosurgery 2005;57 (3 Suppl):S29-39.